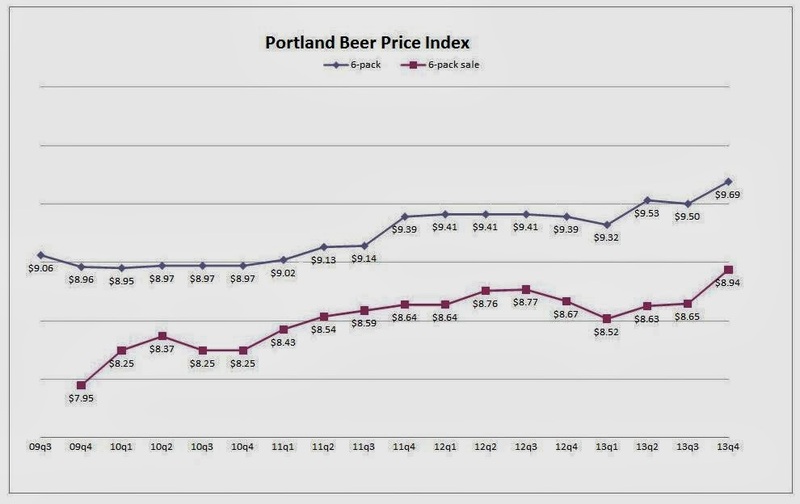 As predicted by a couple of industry followers of the Portland Beer Price Index (PBPI), beer got more expensive in Portland this quarter. It's a pretty big leap, with less generous sale prices accompanying higher shelf-tag prices. There's no clear external driver for this -- I think you can thank Oregon's three-tier system for allowing price fixing by the distributors for this. 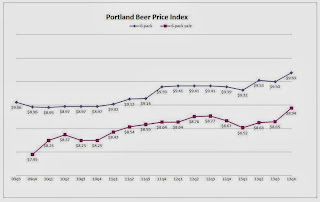 Last quarter, someone commented that beer prices in Oregon are significantly higher than prices in other states... for Oregon beer. This despite the relatively low level of taxation in Oregon. The most likely explanation for this disparity is price fixing by the wholesalers. I have to admit, I get out less and less often these days. The pub prices may be a little out of date, and may get revised (upward) as I make it around to the pubs in the index. If you require more information on the makeup of the PBPI, read the page which describes the composition of the index. Check back in March to see the first numbers of 2014.